So where's the love for these guys!?! A pity they only made six sets, I love everything about them - size, packaging, etc. and they also seem to be very hard to find. Set 5 is the only one I have right now as well. Having a hard time locating the other five sets for a halfway decent price. They've always been really hard to find. I bought the only complete set I've ever seen put up for sale and that was years ago (probably 7 years ago?) 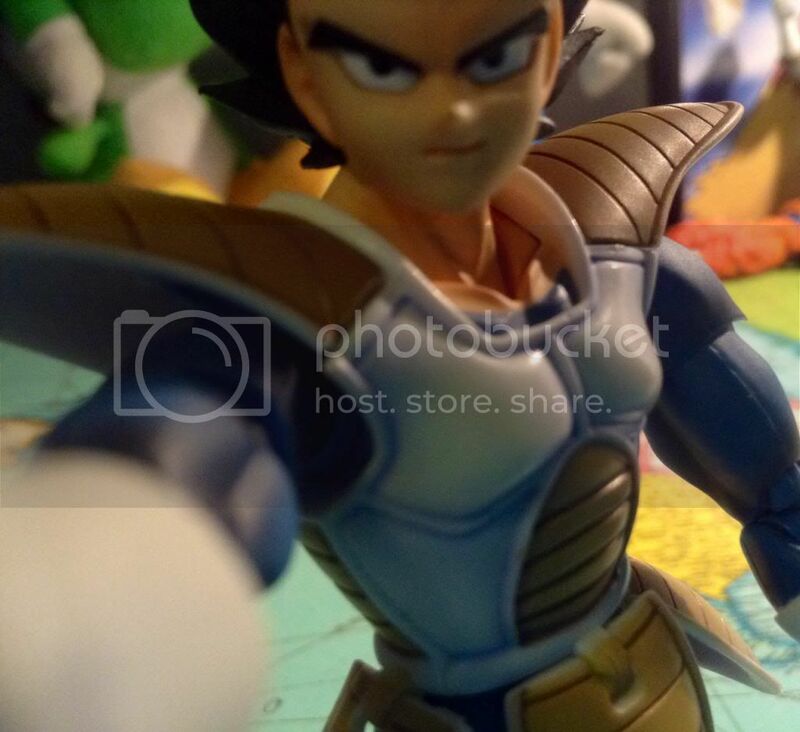 on dragonballtoys.com's forum. I bought mine loose with sliced packaging. I can still put them in the packaging which is kind of cool. 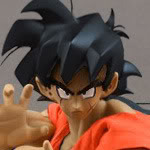 It's amazing the price rises on a lot of Dragon Ball merchandise over the last couple of years. Guess it is good though because it shows there is still a thriving market for it all. Yeah, I'm glad there's still demand for this stuff; I just wish it would plummet long enough for me to get it all! Those are extremely cool. i want the Turles one. Seems to be more and more of these sellers. Did he give you the old out of stock excuse? I'm just glad to hear you did get a refund though it would of been nice to hear exactly why. It is getting worse all the time buying online. Yeah, it is becoming more and more common, unfortunately. It's happened to me twice in a span of about three months; a record for me. But, at least I did get a refund out of him although I'd have much rather got the AB set! There are still two sets I need. Getting closer! Something that's bothersome about these, is that they were either released more than once, or they changed the packaging design at some point. In my pic, you can see I have two different styles. One style (the better one) involves an entirely plastic box. The other style is more fragile and just involves cardboard. I shoved some Real Works transparent stands between the plastic blister and the cardboard pieces so they wouldn't sag. Of my four sets, I only have ones that are still sealed in the plastic clamshell. I always thought the ones that are missing the plastic to be open, tampered with, loose, etc. I'm still missing sets 1 and 3 after passing on set 1 since it lacked the clamshell. They are actually a different packaging design. 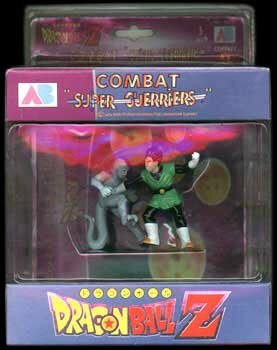 In my small pic, you may not be able to see this, but the plastic clamshell ones (I have two) have a big AB logo to the left of where it says Combat Super Guerriers. The inferior packaging design (my opinion only) didn't have that, and that style is two cardboard boxes floating above and below a plastic blister. You can see my cheap/free method of supporting the blister and top box better, and that's by using some Real Works clear stands. Ah, I didn't realize there were two different packaging designs. Interesting! Not sure why they would do so, the ones with the plastic clamshell just make for a finer collectable as far as MIP visual presentation goes. But then again, these things were made in 1989 when toys as collectables was still a largely unexplored niche for the most part; I guess to AB these were just children's toys no matter how they looked at it. Still yet, the ones with the clamshell just seem to hold up to the tests of time and handling better and are the only ones I'm interested in, personally speaking. But thanks for the insight, Bran! I've learned something new! Monkeyboy has these. I wasn't sure if they all came in the clamshell or not, but based on this, I assume they do. In your first post Eis, you only have the two in clamshell that I also have. 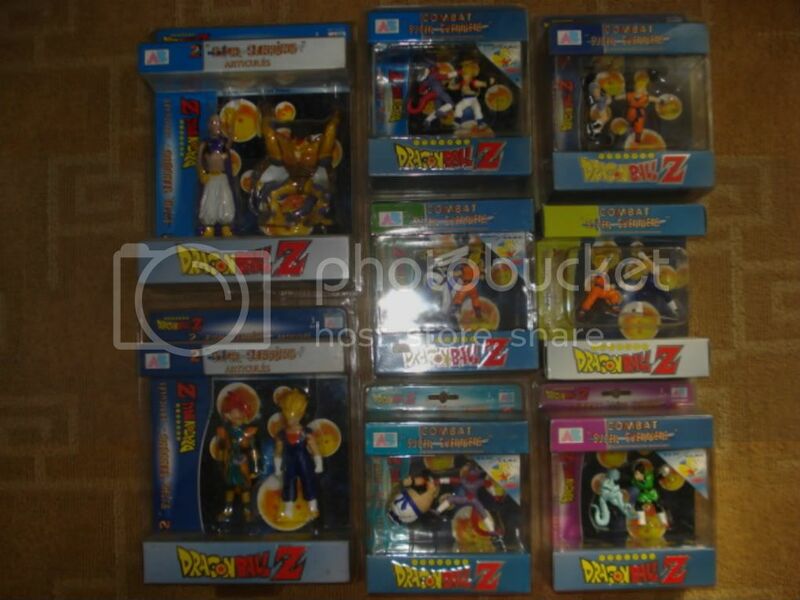 Also, these weren't made in 1989, that's just the confusing copyright on most DBZ stuff. 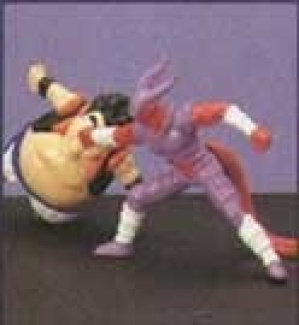 Movie 12 (Fusion Reborn w/ Janemba) wasn't in Japan until 1995, so I imagine these were made around that time. Of the 6, I believe 5 of the sets are specific to that movie. The weirdest of all is SS Goku vs. Turles, which is based on the Plan to Eradicate the Super Saiyans OVA that was part of that Playdia video game or whatever. We used to call it Dragonball Z Gaiden for whatever reason, but you'd have to research what the specifics are if you want to be accurate. The original version was around 1993 and the remake was like 2009 or 2010 and completely redrawn and rescripted. I prefer to refer to the original as Plan to Eradicate the Saiyans and the remake that was included with Raging Blast 2 (a significantly different movie to be honest) Plan to Eradicate the Super Saiyans.